Security for holiday destinations is very much at the forefront of our minds at the moment. For the latest advice visit your Foreign Office (or equivalent) web-site. That said, unless you are entering an area with active military operations the risks are small. Terrorists are generally after a sensational headline involving hundreds or thousands of people. So their targets are likely to be in areas of high population, such as cities or transport hubs. They are unlikely to target safari parks where the numbers at best will be 100-200 in the larger lodges. Local political protests usually occur around election times, which you should be aware of. Again activities tend to occur in the larger administrative towns and not safari parks. Low level subsistence poaching is prevalent wherever there is game, but this is unlikely to cause problems to tourists. We have found small wire snares on small private game reserves and came across a dead giraffe outside Amboseli that had been snared using a heavy wire hauzer. Professional poachers are likely to carry guns but do not want to be caught and operate at night or in remote areas, not in highly populated game reserves. A little more problematic are local conflicts between herdsmen and tribes which occurs from time-to-time. Local tribes often resent restrictions imposed in the game parks, with problems often arising during times of drought when there is little new growth for the cattle to feed on. It is worth bearing in mind Kenya and Tanzania are third world countries and annual earnings are often less than our weekly wage. This can lead to unexpected temptations. Much petty crime is accompanied by violence which is actually no different to the deprived inner city areas of many Western countries. The press often sensationalise 'tourist' crime to get the headlines! Don’t brandish a heavy gold bracelet or diamond encrusted ring (Alison has a complete set of replacement jewellery she takes on holiday that has no emotional entanglement – including her wedding and engagement rings). Only expose your expensive cameras where absolutely necessary – preferably not in town. Be aware of your surroundings & the interest you attract – if you feel uncomfortable find the nearest international hotel or store. Carry as little cash as possible. Split it into smaller rolls and don't flash large wads around. Before getting out of your vehicle (or safe surrounding) separate out the amount you think you're going to need and put it in one of your pockets. Use your room safe or hotel's safety deposits, even on safari for all your valuables. Remember credit cards and even Western passports have their own value. Wherever possible book all-inclusive accommodation and charge bar bills, laundry etc to your room, so you can settle the whole account by credit card before departure (and do settle your bill before leaving, unlike a particularly troublesome guest whose family had raided the boutique shop during their stay). You'll find the whole holiday so much more relaxing when you're not continually thinking about safeguarding your valuables! 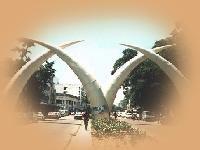 We take this even further and no longer go into the larger towns like Nairobi and Mombasa. We've seen everything we want from them already. Even on stop-overs we tend to pick smaller luxury guest houses out-of-town and closer to the airports. During the numerous elections we actually planned to be in the safari parks, which don't attract crowds of protesters. Considering all of the above, we have often travelled to countries with travel warnings or in one case a travel ban and by avoiding high risk areas have never encountered any problems.